Welcome to Tea Tuesday, the day of the week I focus on the time honored ritual of gathering for tea and a chat. I often find that a great conversation, like a good meal, takes on a wonderful life of its own, a delicious blend of flavours: personal accounts, popular media and topical news events. Today, we use the tea ritual as a common thread to connect seemingly random thoughts. I offer a new recipe each week, so check out and bookmark Online Guide to Afternoon Tea to keep up to date. I love the Post Edwardian period of Downton Abbey, but I also find time travel to the 1960s of Mad Men fame to be enjoyable as well. 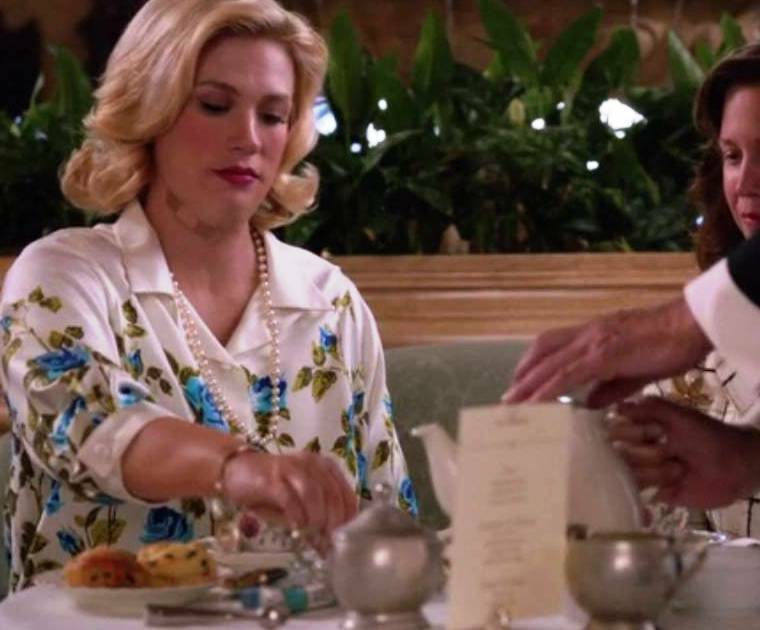 I thought it interesting to see this scene from E3 where Don’s ex wife Betty Francis shares cream tea with a friend. In her new life she is married to old money, so makes sense that she would have adopted the traditions of taking tea. I am unsure of how long January Jones will have to wear the fat suit this season, but kudos to her on-screen husband Henry who loves her all the same. Off screen, fans are abuzz about whether they love fat or skinny Betty best. Perhaps the shakeup has something to do with some of the rivalry between the two shows. After all, this past September, Downton beat Mad Men for the Guinness Book of World Records ‘most critically acclaimed television show’, becoming the first British show to do so. Surprisingly, men are tuning into Downton Abbey over Mad Men. Ratings for season two of Downton were up 100% among men 18-to-34-years-old. They were also up 100% for men 35-49. Exactly 100 years ago today, the famous Titanic set sail for its maiden voyage from Southampton to New York, with 2,200 passengers and crew. Four days later Titanic collided with an iceberg and sank; 1500 people died and 700 survived. The event marked the starting point for Downton Abbey. The fictional Crawley family lost 2 heirs, and as you have likely seen and heard this week, famous families like Astors were affected, and entire families in steerage were wiped out. Myself, I think of Charles Hays, head of the Grand Trunk railway, who founded Prince Rupert, BC, where my family annually goes fishing for salmon. Had he lived, his great plans for the deep sea port might have come to fruition a hundred years sooner. If you have been following along for the past couple of months you may have noticed a great deal of attention I have paid to the last menus of Titanic. For students of food history, the food on board provides the ultimate example of dining extravagances of Post Edwardians. Because of the significance of this event, great care has been taken to preserve the menus and recreate them in honor of the passengers and crew. I have almost finished working through the 1st, 2nd and 3rd class (steerage) menus. Today I am focusing on dairy. I was inspired by an email I received from Irish Dairy Board who markets great dairy products in the US under Kerrygold; they are interested in some of my Titanic recipes for their new blog. The mention of dairy products invariably brings back childhood memories of having a milk cow which required milking twice a day. Our fridge was filled with 4 litre ice cream containers filled with unpasteurized milk, a thick layer of cream floating on the top. It was a challenge for an active family of five to drink that much milk, so mom took to making creamy butter, yoghurt, and my favorite, ice cream. At some point, Dad managed to find a cream separator (pictured above) which was a much more efficient way of separating the milk from the cream. This model is likely from the 40s, but they were invented at the turn of the century. 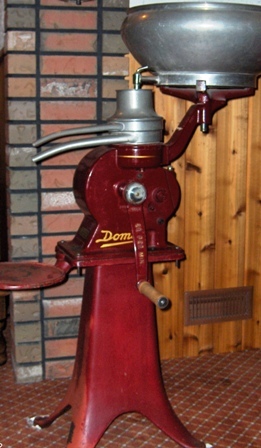 You poured milk into the large basin above and turned the crank which rang a bell until you reached 60 rotations a minute, the optimum speed for the multiple disks inside the machine. You opened the spigot to let the milk come through and had catch containers for both milk and cream. The milk cow is long gone, but the cream separator still holds a place of honor in my parent’s basement out on the farm. 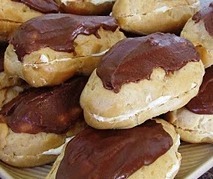 Eclairs were served in 1st class as the 10th sweet course. It is also a popular item on tea trays around the world. Here is a delightful how to video and recipe from Kathie Tyler’s Afternoon Tea. You can find Kathie on public radio at http://www.wcrfm.org.uk for other afternoon tea recipes and lots of chat. French ice cream was served alongside the eclairs in 1st Class, while American ice cream was part of the dessert course in 2nd Class. The difference between the two is egg yolks found in the French version. Cooks on Titanic were lucky to have electric driven ice cream makers to make the freezing process less labour intensive. They also would have had freezer compartments to store ice cream. Most homes in this period did not have refrigeration, so you had to make and eat the ice cream right away. Sad, but true! If you did not have servants, you would take turns at the crank, as after dinner conversation, until the ice cream set. Luckily, the ice cream maker in my childhood home was electric. Today’s machines are much more compact and easy to work with. For camp fun, you can try this Play and Freeze version where you use the energy of your kids to do the work. Here is another how to video which makes a batch of both French and classic American ice cream. I didn’t realize that the sinking of the titanic was the start of Downton Abbey. Now I know! Those elcairs looks yummy Pam. Will you be attending a titanic event on the weekend?